Although we never found a suitable unpaved spot to exercise the Raptor, we can testify that this truck makes a delicious everyday companion. Its cabin is so comfortable you never want to climb down from your throne. For 2017, Ford has re-engineered the aluminum box for use on Super Duty models by upgrading the panel thickness of the box to handle the increased loading requirements of the Super Duty line. For 2017, Ford offers more flavors of Fusion than Ben and Jerry makes ice cream. At the top of the long list is the all new for 2017 Sport version, with a 325hp, 2.7 liter V6 powering all four wheels. Moving down the range, Ford also offers a turbocharged 2.0 liter inline 4 making 240hp. The latest offering in Ford’s rag top pony car line is a very endearing product. Hot Rodders will love it for its 435hp and bellowing exhaust note. Sun worshippers will give it high grades for its expansive tanning bed. Every model year sees one manufacturer innovate a new color so scintillating you wonder why no one thought of it before. 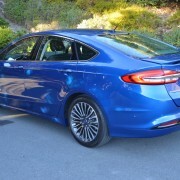 This year, the tribute goes to Ford for their splendid shade of eye candy called Electric Spice Metallic. Ford’s Escape moves into 2016 largely unchanged. If you are savvy, you will order your Escape with the most powerful engine available in the model range, the 2.0 liter EcoBoost motor, which makes 240hp and a whopping 270lb.-ft. of torque thanks to direct fuel injection and a turbocharger. This “one ton” Ford is designed for two primary chores in life. The first is toting heavy loads in its gaping cargo bed, which is rated to carry 2,080 pounds (hence the one ton tag). The second is towing a trailer. Back in the first 1960s heyday of the Mustang, if you saw a button on the dash marked “Shaker” you knew that the ram intake on your hood would open when you pressed that magic button. More cold air meant more horsepower. 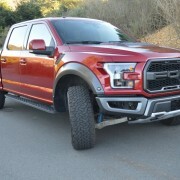 Although Ford’s latest F-150 may look familiar, its what you can’t see that distinguishes it from its predecessors. 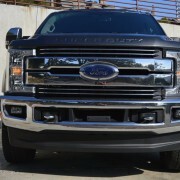 At just 5,000lb, it’s remarkably light for such a large truck. The substitution of aluminum for steel in the cab and body structure has pared curb weight by 700 pounds. As a result, you no longer need a gas swigging V8 under the hood to provide enough punch for acceptable performance. But the beauty of this Hybrid lies in its virtually undetectable transfer from electric to gasoline mode when underway. Whereas most such combo cars let you know quite clearly and noisily when switching from electric to gas power, the Fusion transfers energy source quietly and seamlessly. If you relish having the most expensive house on the block, then the Fusion Energi is definitely the Ford you’ll want to own. You can buy an entry level Fusion S for just $21,900. An upgraded SE is $23,855. A top level Titanium series Fusion costs $30,500. Drivers who still consider a car to be a precision tool rather than a blunt appliance will rejoice that Ford is into the second year of production for the sublimely satisfying Fiesta ST. This extensive portfolio of goodies costs just $25,500, navigation upgrade included. The cabin of the Focus Titanium is so competently organized that you could easily drive this 2,995 lb. compact hatchback across the USA without hesitation or discomfort. Especially compelling are the 17 inch Cooper Zeon RS3-A mud and snow rated tires. The latest Fiesta is an undeniably handsome design, with its ground hugging snoot, upturned tail, and primly pursed Aston Martin copy grill imbuing it with unexpected flair. The only discordant note in the stylistic aria is struck by the 15 inch SE standard alloy wheels, which are visually swamped by spaciously flared wheel wells.